Summer is right around the corner, and we’re getting ready for bathing suit season, looking to increase our health and vitamin intake, and thirsting for a cold, refreshing drink. What better way to feel better about your health than to add some juice to the mix. Yes, juice! It’s not just for kids anymore. The juice and cleanse trend seems to be everywhere these days. Juice can be a very healthy way to add some interest to your daily routine. Just keep in mind, we’re not talking about sugar-packed juices you get in the grocery store. For delicious and healthy juice blends, look no further than Oh! Juice. You may have seen them at your local farmer’s market. Now, they’re even more accessible at the Carlsbad Gateway Center. They also have a tasting room at T Short Gallery in Little Italy. Another tasting room will be opening soon in Encinitas. Like I said, you don’t want to just grab any ‘ol juice from the grocery store. OH! Juice is different. 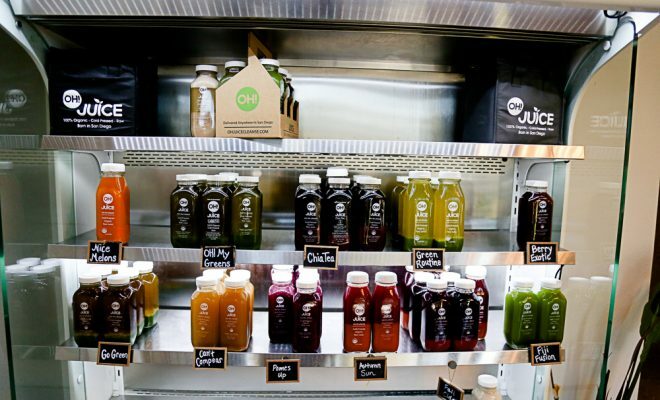 They use locally sourced, raw, cold-pressed juice. At the Carlsbad Gateway Center location, you can watch the cold-pressing process right before their eyes at the tasting bar. The extensive OH! Juice menu has every fruit and veggie you can think of, all grown in San Diego. They source all local, organic ingredients from Suzie’s Farm, Be Wise Farm, Rainbow Valley Orchard, Tom King’s Farm, J.R Organics, Stehly, and more. Since OH! Juice receives produce locally; some juices are seasonal including the popular Strawberry Fields and Pucker Up Strawberry Lemonade, which will be back for the summer season. The most popular OH! Juice is “Go Green,” filled with kale, romaine, celery, lemon, ginger, moringa leaf and burdock root because it’s straight to the point when it comes to incredible health benefits. Or try “Nice Melons.” It’s a classic fruity flavor that is a delicious upgrade from your typical morning orange juice. With their newfound confidence, they decided to use their knowledge of nutrition and business skills, to start their own juice bar. Gregor says that she wanted to create her own avenue to help others and make a change unique from other more commercial organizations. The OH! Juice owners have since mastered the art of juice to impact the health of others. 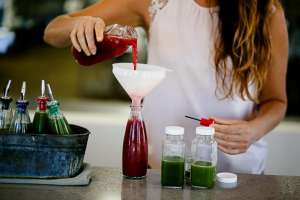 The cold-pressed two-step process first slowly masticates the produce into a watery pulp, and then the mixture is pressed with 2,000 pounds of pressure between two plates to squeeze out all the liquid, leaving a very dry pulp. This process uses no heat or friction and is exposed to little oxygen to retain the maximum amount of nutrients. Because of the unique cold-pressed process, the list of health benefits are long. Studies show the importance of fruits, vegetables, nuts, seeds, and other superfoods. These types of foods are beneficial to the body because they contain massive amounts of antioxidants, vitamins, minerals & enzymes to keep the body free from disease and functioning optimally. Other than cold-pressed juices, OH! Juice offers protein shakes, tonics, teas and superfood shots. Soon they will be adding a full menu that utilizes all organic, local, farm to table ingredients with the guidelines of clean, made from scratch and plant-based ingredients to increase the health of the community. If you are interested, you can become a member of OH! Juice and start the A Cleanse. The cleanse usually lasts 3-5 days or longer. They also have their Lifestyle Program which provides their customers juice each week, on a subscription basis. Not sure if it’s for you? then enter in SD Entertainer’s spring giveaway! Fill out the form below and become a subscriber of SD Entertainer. Your entry puts you in the running for a $50 to Oh! Juice gift card.